Founded in Near West Side in Little Italy on Taylor Street. Ambrose were formed by an Italian youth in the Near West Side neighborhood over in the Little Italy section along Taylor Street in about the mid-1950s in order to battle against the Italian street gangs that dominated that strip. The gang took in Hispanics from the start and viciously battled gangs like the Royal Kings and Taylor Dukes. 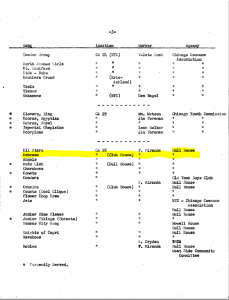 There is solid evidence that Ambrose was around as far back as March of 1959 when a social services report listed a gang called “Ambrose” that was served by the Hull House which is located at 800 S. Halsted in the Near West Side neighborhood in the Little Italy/University Village section which is right in the old neighborhood. Taken from a March 10, 1959 Social Services report from the Welfare Council of Metropolitan Chicago. Here is undeniable proof Ambrose existed in the 1950s and on the streets of the Near West Side neighborhood. They were assigned to Hull House which was right in Little Italy and close to Taylor Street where Ambrose was said to have originated. 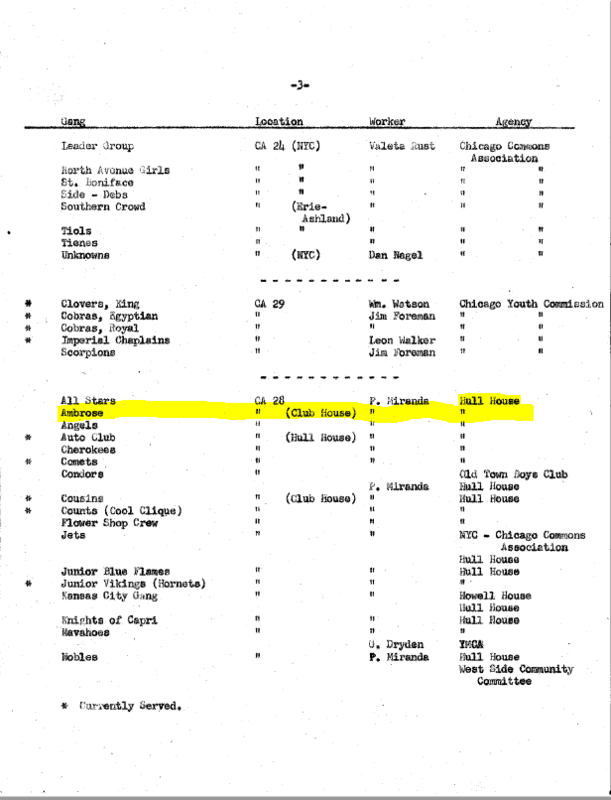 All gangs were assigned the social services houses closest to their territory at the time, since Ambrose was given Hull House it means their territory was within the vicinity back in the 50s. If they were in Pilsen they would have been assigned to Howell House. In the year 1960, Ambrose migrated to the Pilsen neighborhood landing at the intersection of 18th and Throop which started an all new chapter for them. It was said that an Ambrose named Armando started the Pilsen branch in 1960 but I can’t confirm it was Armando, but can confirm they arrived in the year 1960. As soon as Ambrose formed in Pilsen, they immediately wanted to dominate all down 18th street and gangs like the Spartans, Rampants, Morgan Deuces, Satan Disciples and Latin Counts were in their way. Ambrose immediately made a name for themselves by battling these top clubs all around them while they played baseball in their leisure time. The 1960s was a time for both Ambrose and Latin Counts to start absorbing smaller clubs, just like Black P Stones and Black Disciples were doing in the black neighborhoods and it was at this point in time when Ambrose built a very strong presence at 21st and Paulina “Wildside.” The gang wars between the two would rage on into the early 1970s. At this point in time Ambrose was now being led by Louie Limas as Ambrose got involved in the drug trade and so did their rivals the Latin Counts and Satan Disciples and now with drug turf at stake meant more war. In the year 1973, Ambrose met with the Black Gangster Disciples and worked in collaboration with Simon City Royals and Ashland Vikings to arrange a business deal. These gangs would carry out hits for each other to protect their alibis. This was also the first unity before the Folk Nation. Louie Limas was convicted in 1974 of shooting rival Satan Disciple gang members at 1605 Fairfield (16th and Fairfield) in the North Lawndale neighborhood and was put in prison for a few years (People vs. Rodriguez, 1980). Sometime in the mid or late 1970s Louie Limas was growing his organization incredibly and even was said to have owned a liquor store in Little Village around 26th and California, he was then assassinated my Reno “Maniac Mouse” Enriquez of the Latin Counts on August 17, 1979, this story made the newspaper but I am not sure if Enriquez was convicted. Limas was 26 years old when he was killed; therefore, he was too young to have been the founder of Ambrose. In the year 1978, Malo, who was the cousin of Two Two Boy founder Anna Esquivel and Cicero Two Two Boy founder Jimmy “Jimbo” Gomez, was coming around the 22nd and California area to make sure his cousin was doing alright. In the process this caused Ambrose to hang out with the newly formed Two Two Boys and this led to a branch of Ambrose forming at 26th and Kolin. Two Two Boys hung out with the 24th and Washtenaw Satan Disciples and the Two Two Boys were the buffer that prevented Ambrose and SDs from continuing their feud and a three way alliance was established, thus ending the long time war between SDs and Ambrose. At the same time Two Two Boys and Ambrose had family members in the Two Sixs and the alliance was extended to the Two Sixs and these four organizations teamed up against the Latin Kings and other common rivals. Ambrose, Satan Disciples and Two Six joined the Folk Nation together in 1978 but kept Two Two Boys as close allies. As the 1980s ushered in Ambrose opened turf in the Marquette Park neighborhood along 63rd street. Ambrose would build a rock solid presence along to 63rd street corridor with sets at 63rd and California and 63rd and Mozart. Ambrose would then spread further into Marquette Park and open territory in Gage Park and in the South Chicago neighborhood. Ambrose would also set of factions in the Chicago area suburbs. In the year 1986 Ambrose would find themselves in the midst of their first interalliance war with a fellow Folk Nation gang that was one of the four south side Latin Folk street gangs that had established a brotherhood. On November 7, 1986 Two Sixs from K-Town had claimed members of Ambrose shot at them and now Two Six was looking for revenge. Word was that there was an Ambrose party going on at 6318 South Washtenaw in the Marquette Park neighborhood. At about 8:30 P.M. the Two Sixs sent two female gang members to the party to scope it out, the girls were dressed in black and beige and were unfriendly so they were thrown out, but they gathered enough info to take back to fellow gang members. Later that night Two Six gang members Stoney, Jason Gray, Little Hulk, No-Neck Rabbit and Inky crashed the party that was being held in the basement according to court documents. They knocked on the door and when it was answered and the door opened, according to court documents, Jason Gray opened fire on the party then Manuel Bobe also known as Little Hulk opened fire as well. By the time the shooting stopped three people were killed and one was wounded (Illinois People Vs. Manuel Bobe, March 27, 1992). This started a major war between Ambrose and Two Sixs that never would end. By the year 1988 Ambrose was also at war with fellow Folk Nation gangs like La Raza mainly because La Raza was still heavily allied with Two Six. Ambrose continued to grow in the 1990s and this brought them new rivalries with fellow Folk Nation gangs in the early 1990s over drug turf. At this point in time the Folk Nation was no longer unified by 1991 and wars were rampant on the streets and permitted. Ambrose went to war with the following Folk Nation gangs in the early 1990s; Satan Disciples, Gangster Party People, Racine Boys, Maniac Latin Disciples. The only allies Ambrose had at this point was Two Two Boys and an off and on relationship with the Cullerton Deuces after they joined Folks in 1994. Ambrose opened turf at 63rd and Francisco after they aggressively recruited the Francisco Boys crew. Ambrose has also had a long standing relationship with the Gangster Disciples as both gangs were connected in the drug business in Marquette Park. Ambrose had a lot of potential to grow into one of the top 10 largest gangs in the city but it was the police that majorly stunted the growth and crippled the operations of Ambrose with “Operation Blue Water” that shut down a major PCP lab and caused many Ambrose to end up in prison. It is because of this police sting that Ambrose lost territory on 18th street, even worse they lost 18th and Throop which was their headquarters and Latin Counts moved in to take over that corner now that the police arrested many Ambrose. Please send in old school pics but I would love to see some 1950s and 1960s pics! What was Ambrose first exact street corner and what total turf did they have in Little Italy? What exact year did Ambrose form? Who was the founder of Ambrose? What happened to him? Who were Ambrose enemies in Little Italy? What corners did Ambrose have in Little Village and what years did they close down? Who took over leadership after Louie, and what is the time line of leaders after Louie up to the year 2000? What year did 63rd Street and Marquette and Gage Park chapters open? What exact year did Ambrose go to war with Satan Disciples, Party People, Racine Boys, MLDs and GDs? What was the reason for the wars?